A Banner Flag Helps Expand Any Custom Base! These Advertising Pennants are Priced Right! Professional Banner Flag Company Sells Quality Business Signs Online! 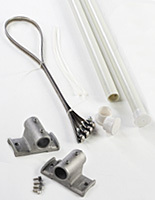 These banner flag brackets are adjustable light pole mounting signs. Each of the two supports moves upward and downward up to 1-1/4" to keep the displayed flags taut. Modifications are usually made while the models are affixed on a light pole with a flag on exhibit. The banner flag brackets have teeth that interlock, guaranteeing both sides stay in position. Merely tighten the bolts with the provided Hex wrench to safe the mounts at the desired height. 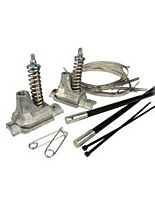 The screw gear bandings are sized to attach to most outside uprights or light poles. The screw gear bandings have a fast-opening, worm drive to permit fast tightening and fast removal of the banner flag brackets. These models can maintain a flag on a tapered pole, as every screw gear banding adapts individually. These discount banner flag brackets for sale are usually utilized to attach a double-winged light pole signage as well. Merely order two models for affixing street flags side-by-side. Fabrication is uncomplicated and straight forward when utilizing the provided instruction sheet for reference. 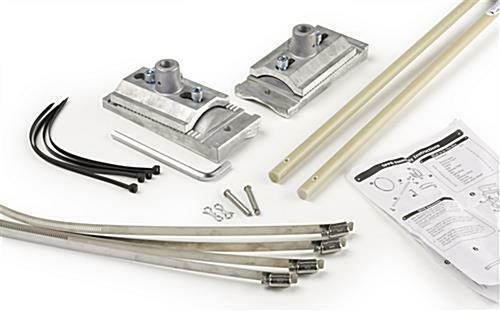 These banner flag brackets involve all the materials essential to attach 36"w flags. The materials are extraordinarily long-lasting. The fiberglass poles will not break in moderately windy weather. 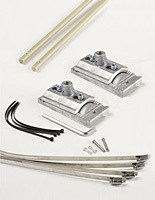 These banner flag brackets include zip ties that connect to ringlets in your street flags and holes machined into the cast metal mounts. The zip ties hold the street flags in position, guaranteeing they do not "bunch-up" or fall off the poles. These professional banner flag brackets for sale, called flag affixing tools, are more practical than most other models.